Nestled into the forests on the sides of precipitous mountains, Zagorians prospered during the occupation of the Ottoman Turks because their inaccessibility allowed them to live autonomously. Some became traders and established trade routes through the Balkans to cities as far away as Vienna, Bucharest and Odessa. They constructed an extensive system of pathways to accommodate their mule caravans. Along the road to Vradeto, you can glimpse the Skala of Vradeto as it winds its way steeply up a cliff. It is an old cobbled footpath from Tsepelovo that passes through a gorge and until recently, it was the only access to the village of Vradeto. The Zagorohoria is best known for its traditional villages with their stone buildings, slate roofs and cobbled paths, all constructed with local stone. At first glance, the simple, austere structures look alike except for differences in size. The similarity ends, however, when you step across the threshold of a house. They are often exquisitely decorated with frescoes, painted cupboards and elaborate wooden carvings on the ceilings. Some of the loveliest two-story mansions are found in Papingo and Monodendri, entire villages which have been declared as national historical monuments. Also of interest are the 18th and 19th Century folk paintings that decorate some of the houses in Skamneli. 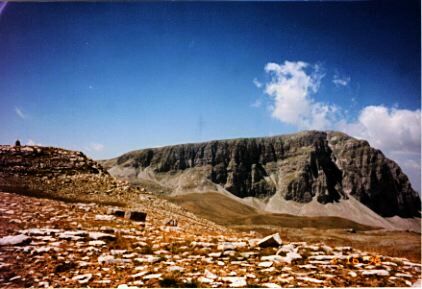 Resembling the Alps rather than other Greek mountains, the Gamila massif towers over the Aoos ravine to its north and the Vikos Gorge to its west. It is its western face with spectacular views of the Pyrgoi (Towers) of Papingo and the unforgettable grandeur of the Vikos Gorge that makes the villages of Megalo Papingo and Mikro Papingo a favorite destination in Zagoria. To the south, the Gamila Mountains descend more gradually to a large tableland that ends abruptly as it plunges down into deep ravines. In the summer, shepherds tend their sheep on this high, grassy plateau. It is a desolate land and unlike the European Alps, there are no picturesque Alpine villages in the valleys below or even the general bustle of well trodden trails. In this wide open space, the absence of lifes usual stimuli sharpens your senses and with an altered consciousness, endows you with the joy of living each moment. There is a boundless silence and only the distant bark of a sheep dog or the sound of falling rocks intrudes on the utter stillness. The rugged terrain unfolds its beauty slowly and gently for those who pass through in the same way. Majestic peaks soar above you with a timeless air of watchfulness. Clouds saunter across crisp, blue skies while cooling breezes refresh you even on the warmest summer day. 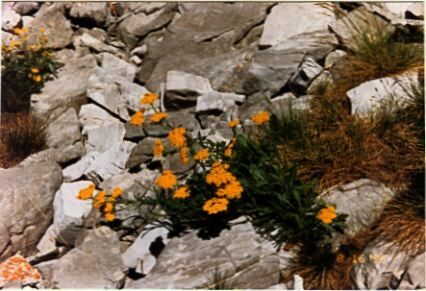 The rocky places are guardians of tiny, boldly colored flowers that beckon to the honey bees. Pure mountain water drips from rocks and small tarns invite you to gaze on the reflected splendor that surrounds you. It is impossible to tread these ancient, solitary paths without reflection and one can appreciate why wise Zagorians say that Greeks discover their true essence in these mountains. Remnants of the ancient European forests survive only in Greece, Finland and Sweden, the three most densely forested countries in Europe. Unlike the Fenno-Scandia forests which are mainly coniferous forests, the extensive forests of Northern Greece are comprised of mixed forests with the widest diversity of highland trees in all of Europe. The Vikos-Aoos National Park is a part Greeces unique patrimony and was established to protect the rare and threatened flora and fauna of the region. The Aoos Ravine and the Vikos Gorge mark its boundaries which roughly encompass Western Zagoria and parts of Central Zagoria. The forests of the Aoos Ravine are beautiful, especially in the autumn when the land is emblazoned with color. The brown bear (Ursos arctos) and the lynx (Lynx pardinus), two of the most endangered species, are found here. The forest habitat is essential to their survival. Wild boar (Sus scrofa), the wolf (Canis lupus) and the roe deer (Capreolous capreolous) also live in these forests while high on the surrounding cliffs, chamois (Rupicarpa rupicarpa balancanica)graze and eagles and vultures make their nests. A popular route for exploring the Aoos Ravine is to follow the marked trail from the Konitsa bridge to the Moni Stomiou (Stomiou Monastery). The return trip takes about 5-6 hours making it one of the shortest and easiest unguided walks to be undertaken in Zagoria. Lengthier and much more strenuous approaches can be made from the Gamila refuge on the Astraka saddle (8 hrs.) or from the village of Vrissohori. The Vikos Gorge can be viewed for most of its length from the Balkoni tou Vikou (Vikos Balcony). This breathtaking view is well worth the half an hour car ride from Monodendri through deciduous forests and past layered rocks of gray-colored flysch that characterize the villages of Zagoria. A trail from Monodendri descends to the bottom of the gorge and follows the course of the Vikos river through thick forests where beautiful wildflowers and medicinal herbs grow in abundance. About half way, the smaller Mega Lakko ravine intersects the gorge and it is in this part of the surrounding forest that the Greek brown bear may also be found. After about 10 km, the trail emerges from the confine of sheer cliff walls to the Voidomatis Springs (about 6 hrs.) from which the trail forks leading to the villages of Vikos (about ? hr.) and Mikro Papingo (about 2 hrs.). Getting There: The most convenient way to visit Zagoria is by car. Cars may be rented in Ioannina, Thessaloniki and Athens but general availability and the best values are to be found in Athens. From Athens, take the National Highway to Larissa. An excellent primary road takes you west from Larissa to Ioannina via Trikala and over the Katara Pass. This portion is an interesting and scenic drive that takes you past the famous monasteries of Meteora and through gorgeous mountain landscapes. Most of the access roads to Zagoria are located between Metsovo and Konitsa along the main highway from Ioannina to Kastoria. Ioannina is the nearest destination for bus and air service from major Greek cities. If you plan to rent a car here, make advanced reservations because availability is limited, especially in the month of August when most Greeks take their vacations. There are daily local buses from Ioannina to the villages of Papingo, Monodendri and Tsepelovo as well as the many villages along the way. A few small Zagorian villages are still accessed only by footpaths. Hikers require a comfortable day pack, water bottles, good maps, a compass and sturdy hiking boots when trekking in these remote, rugged mountains. Collapsible ski poles or at least a strong stick should be carried as protection against the ferocious sheep dogs that you are likely to encounter as you pass through the highland pastures. Great distances make camping gear necessary for any serious exploration of the Gamila Massif. Provisions and supplies should be purchased in Ioannina as they may be unavailable in the villages. General Information: Room reservations are unnecessary in the Zagorohoria unless you are planning to visit at festival time, August 15th to 18th. The Greek National Tourist Organization produces a brochure titled "Epirus" which lists a number of hotels in the larger villages and their telephone numbers. However, you only have to locate the main square, the plateia, and ask for a room. You will be directed to the nearest hotel, pension or domatia. Rooms are clean and comfortable and cost about $30-$40 for a double. Meals may be arranged with your host or at the village taverna. 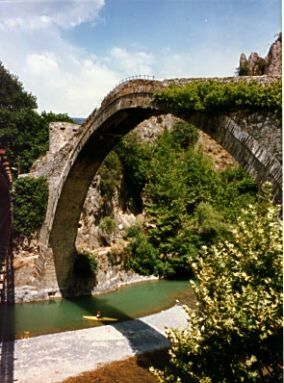 Zagoria offers one of the best values in Greece where you can visit and explore the mountain villages for about $25 per person per day for food, lodging and local transportation. A rental car and/or a mountain guide will add to the daily cost but is quite reasonable when shared with a group of 4. Hiking in Zagoria is strenuous. Most trails up the Gamila Massif are steep and lengthy. It is a good idea to break up your trek with visits to the nearby villages. Using the Gamila refuge as a base, you can hike to Drakolimni of Gamila, climb to the peaks of Gamila and Astraka and explore the Mega Lakko Ravine. Arrangements for use of the refuge must be made at the EOS office in Megalo Papingo (Tel. 30-653-41-138) or through the EOS representative in Mikro Papingo (Tel. 30-653-41-257). They will also provide information and maps. Do plan your itinerary to include the nearby archaeological site of Dodoni, one of the oldest settlements in Greece dating back to 2500 BC and the site of an ancient oracle. Do make the time to visit the Valia Calda (Warm Valley) National Park. 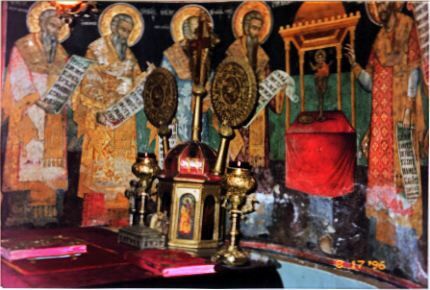 It is located midway between Vovoussa in Eastern Zagoria and the village of Milia near Metsovo. It is a paradisaical valley surrounded by the peaks of the Ligkos Mountains and heavily forested with pine and beech trees. There are beautiful stands of Scots pine (Pinus silvestris) and the Valia Calda marks their southernmost range in all of Europe. Do stay clear of sheepfolds and flocks of sheep when hiking. Inevitably, there will be fierce sheep dogs nearby. Local people say that they become friendly when you sit on your haunches but it is difficult to assume such a vulnerable posture in the presence of these huge, snarling, spike collared dogs. Do use a guide, especially when hiking in remote, forested areas or the less popular trails. Trails are not always well marked and it is very easy to become lost. Be sure to notify someone of your intended itinerary before setting off into the mountains. Do attempt to meet Zagorians. Many speak other languages and you will find them to be some of the friendliest people in the world. In Zagoria, you will not find the cynicism that sometimes accompanies tourism. Here, visitors are still treated as welcomed guests. Do be forewarned that Zagoria is a place of enchantment. Your visit will always be too brief and you will yearn to return. It is a land where time seems to stand still, where life is still entwined with nature and people treat each other with honor and kindness. Mr. Alexis Gouris is the proprietor of the Hotel Gouris and the general store on the town square. He is a helpful and friendly gentleman who speaks excellent English and will gladly share his extensive knowledge of Zagoria. He is also the custodian of the keys to the beautiful, little church in Tsepelovo. Mention Adventures Great and Small for an all inclusive price of US$50 per person per day which assumes double occupancy and includes a room with private bathroom, all meals and a personal guide. Greece: A Lonely Planet Travel Survival Kit by David Willett, Rosemary Hall, Paul Hellander and Kerry Kenihan provides excellent general travel information on Greece. We particularly like the insights that are highlighted against a blue background.